This was a welcome return by the Club to the Kinloch Rannoch Outdoor Centre. It was also a very warm welcome to a meet for our Glasgow branch. Despite a dreadful forecast on Saturday, members set off optimistically with a range of objectives. 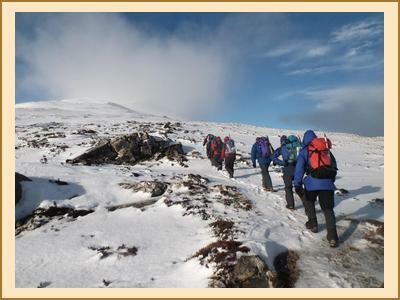 Most were part of a mass assault on Beinn a' Chuallaich, the Corbett immediately behind the Centre but, having almost attained the summit, they were driven back by an obviously unstable snow pack. As one member commented, the hill only needs to win once - you need to win every time, and it will still be there another day. Significant consolation was gained from a visit to the coffee shop in the village, which received very good reports. One or two members opted to go straight for the consolation of the coffee shop, avoiding the inconvenience of walking up a hill. 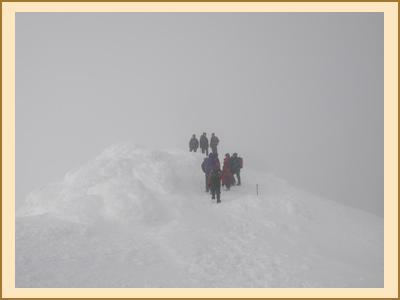 James and Aga set off to climb Schiehallion from the north but retreated at 900 m due to strong winds and a white-out. Meanwhile Tim, Claire and Ian did Carn Dearg, ascending by the south ridge over Sron Leachd a' Chaorainn from Rannoch Station, enduring hideous conditions - gale force winds and a sustained white-out, before descending via the Loch Ossian Youth Hostel to Corrour station and the evening train back to Rannoch. Sunday saw another mass assault, this time on Schiehallion. Despite strong winds, the day was bright and sunny with beautiful snow conditions and, while on the hill, we met Alison and Kenny - conspicuous absentees from the meet. No prizes will be awarded for guessing who managed to achieve at least 50% of the descent on their sledge. Paul, Perry and Antti climbed Meall a' Choire Leith from Glen Lyon, while James and Aga did Tolmount from Glenshee. The Shiehallion party were joined by Alison and Kenny for coffee and cake at the Watermill in Aberfeldy - also very highly recommended for anyone who is in the area. As is usually the case, the Club managed to conjure up two very good days despite the weather, the venue certainly contributed to making a good weekend, and we have to put it down as another successful EMC meet.